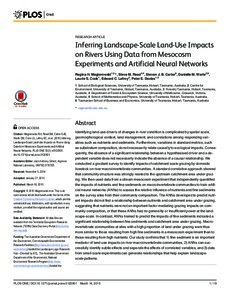 Identifying land-use drivers of changes in river condition is complicated by spatial scale, geomorphological context, land management, and correlations among responding variables such as nutrients and sediments. Furthermore, variations in standard metrics, such as substratum composition, do not necessarily relate causally to ecological impacts. Consequently, the absence of a significant relationship between a hypothesised driver and a dependent variable does not necessarily indicate the absence of a causal relationship. We conducted a gradient survey to identify impacts of catchment-scale grazing by domestic livestock on river macroinvertebrate communities. A standard correlative approach showed that community structure was strongly related to the upstream catchment area under grazing. We then used data from a stream mesocosm experiment that independently quantified the impacts of nutrients and fine sediments on macroinvertebrate communities to train artificial neural networks (ANNs) to assess the relative influence of nutrients and fine sediments on the survey sites from their community composition. The ANNs developed to predict nutrient impacts did not find a relationship between nutrients and catchment area under grazing, suggesting that nutrients were not an important factor mediating grazing impacts on community composition, or that these ANNs had no generality or insufficient power at the landscape- scale. In contrast, ANNs trained to predict the impacts of fine sediments indicated a significant relationship between fine sediments and catchment area under grazing. Macroinvertebrate communities at sites with a high proportion of land under grazing were thus more similar to those resulting from high fine sediments in a mesocosm experiment than to those resulting from high nutrients. Our study confirms that 1) fine sediment is an important mediator of land-use impacts on river macroinvertebrate communities, 2) ANNs can successfully identify subtle effects and separate the effects of correlated variables, and 3) data from small-scale experiments can generate relationships that help explain landscape scale patterns.